The powerful air Brigades of the Honorable Eclipse Company are becoming a common sight around the world, as canny or desperate military commanders and politicians empty their coffers to employ these highly trained and well-armed specialists. The mighty Elysium Class hybrid airship forms the core of this set's strength. This versatile vessel carries a swarm of stout Horten Kestrel and Sparrowhawk combat aeroplanes, as well as impressive firepower; capacious bomb bays, serried broadside automatic cannons and, most significantly, the notorious (and very loud!) Armstrong Earth Shaker cannon. 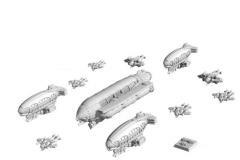 A trio of Phoenician Scout airships fly in support. These flamboyant craft pack heavy firepower of their own, with a brace of heavy cannon and substantial bomb-load, making them equally threatening to air and surface targets. More agile striking power is provided by the Oceanus and Hades class battle aeroplanes, the mainstay of the HEC's aerial support forces. The large, sturdy Oceanus is a long-range strike bomber, though its automatic cannon fittings make it a tough prospect in aerial combat. The exceptionally swift Hades is a consummate aerial hunter, its skilled pilots adept at weaving through enemy counter-fire to deliver stinging punishment with their braces of cannon and machine guns. Together, these formidable craft form a powerful air Brigade. The HEC prides itself on service without prejudice, so whatever your faction, they will be willing to give their all in battle...for a suitable fee, of course! Be sure to hire a Brigade to support your core forces.